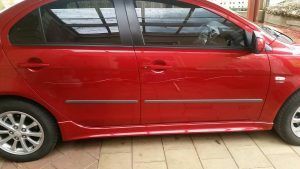 Why is it that even when a car is washed regularly there still seems to be scratches, chips, scrapes and swirl marks appearing. It’s so frustrating and what’s worse is that only some of the causes can be avoided. The environment where the vehicle is driven and garaged plays a large part in the general ability to upkeep the vehicle. For example city drivers aren’t as likely to be getting stone chips like a country driver. Although stones and the like can still be thrown up from driving behind trucks and other large vehicles. If these stone chips are left they can leave the panel exposed to the elements which can lead to rust. You definitely don’t want that happening as you’ll be paying for scratch repairs. Car parks are notorious for small scratches and scrapes. Whether it’s a careless driver that has misjudged turning in our out of a carpark or one of those bollards that sit in the blind spot it can leave the car perfect mechanically but just looking a little less appealing. With all the after market features offered on vehicles today it can make drivers a little reliant on sensors doing the job for them. All it can take is a faulty sensor or something blocking the sensor from registering something in the way and bang. There have also been situations where the automatic sensors on garage roller doors haven’t registered the vehicle there and have continued to close regardless. Evidence shows that a car garaged and protected from bird droppings, extreme sunlight and carwashes will maintain it’s new car appeal far longer than an exposed vehicle. Even hand washed vehicles can accumulate fine scratches and swirl marks over time if all embedded particles aren’t removed. These can be more noticeable in direct sunlight and can look like spider webs. These cannot be removed by basic washing and may need a light polish to remove this ground in dirt. 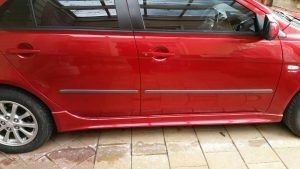 Using a wax over your vehicles paintwork along with quality car care products won’t stop the larger scratches from happening but will assist with the micro scratches and general condition of the paintwork. As you can see the need for scratch repairs doesn’t need to be the result of an accident. There are many causes and only some that we can control. This entry was posted in scratch repair and tagged scratch repair. Bookmark the permalink.